Democrats say they’ll convene a commission this summer to develop ideas for reorganizing state government. Senator Staci Appel, a Democrat from Ackworth, says it’s been a quarter of a century since legislators and former Governor Terry Branstad shrunk the number of state agencies from 64 to 24. "We’ve been doing some of the same thing for 25 years," Appel says, "and it makes sense to change the delivery of some of those services and streamline those and make them better and more efficient for our Iowans." Representative Mary Mascher, a Democrat from Iowa City, says they’ll be looking for long-term solutions. "We’re not looking for quick fixes here," Mascher says. "We’re looking for systemic changes that will be in place for years to come and that will make our government more efficient." The State Government Reorganization Commission will be asked to make "tough choices," according to Mascher. "We are making some of those tough choices now in this year’s budget. We’ll have to make more tough choices next year," Mascher says. "Rather than do that in a piecemeal fashion, the commission could give us some bold alternatives and that’s what we’re looking for — bold alternatives." 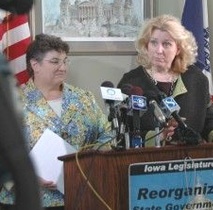 The commission’s recommendations would be presented to the lawmakers in late 2009 for the consideration of the 2010 Iowa Legislature.